The following page not only offers images of elliptical galaxies but astronomical data from many sources including, The Hickson Compact Group of Galaxies by Paul Hickson ( 1982 ) and Arp's Catalog Of Peculiar Galaxies by Halton Arp ( 1966 ). Both of these sources list, amongst others, elliptical galaxies and I am indebted to NASA/IPAC Extragalactic Database ( NED ) which is operated by the Jet Propulsion Laboratory, California Institute of Technology, under contract with the National Aeronautics and Space Administration for the online publication of research work contained within these catalogs. Additional astronomical data for stellar objects is from either the Simbad Data Query site or the HEASARC Data Archive. "As their name suggests, compact groups are small systems of several galaxies in a compact configuration on the sky. The first example was found over one hundred years ago by [Édouard] Stephan ( 1877 ) who observed it visually using the 80-cm Foucault telescope of the Observatoire de Marseille"  Paul Hickson  While much of the fame has gone to the plethora of beautiful images that have been displayed in popular media the world over, there is a wealth of lesser known stellar objects that are just as breathtaking; their titanic interactions emmense beyond belief. At right are two images of Stephan's Quintet also known as HCG 92a, HCG 92b, HCG 92c, HCG 92d and HCG 92e. In the left frame is a section of the original 12.9' x 12.9' image from the Palomar Observatory Sky Survey ( POSSII ). The colorful image in the right frame is a "false-color composite image of the Stephan's Quintet galaxy cluster [which] clearly shows one of the largest shock waves ever seen ( green arc ), produced by one galaxy falling toward another at over a million miles per hour." The image composite is made up of three data sets taken at the various wavelenghts of light  near-infrared light ( blue ) and visible light called H-alpha ( green ) from the Calar Alto Observatory in Spain, operated by the Max Planck Institute in Germany and 8-micron infrared light ( red ) from Spitzer's infrared array camera. "Four of the five galaxies in this image are involved in a violent collision, which has already stripped most of the hydrogen gas from the interiors of the galaxies. The centers of the galaxies appear as bright yellow-pink knots inside a blue haze of stars, and the galaxy producing all the turmoil, NGC7318b, is the left of two small bright regions in the middle right of the image." [Ibid] The elliptical galaxy HCG 92e is at lower right in the above images. 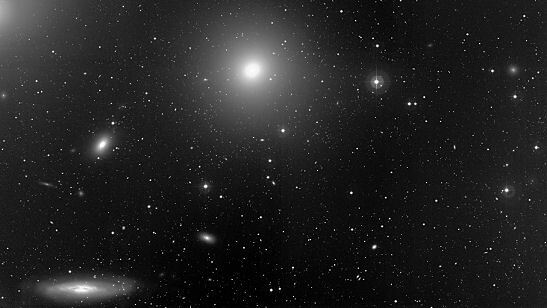 In the HCG catalog is a section on studies conducted with regard to the structure and morphology of various compact groups in which elliptical galaxies are included ( see 5.2 Compact-group galaxies ). Though outside the scope of this page, Hickson asked, "Are the galaxies in compact groups in any way distinct from those in their immediate environments? Rood & Williams (1989) and Kindl (1990) both found that compact groups, including those in rich environments, contain a significantly smaller fraction of late-type ( spiral and irregular ) galaxies than do their neighborhoods." Remembering our previous discussion regarding the formation process of elliptical galaxies, we can perhaps see one of the reason why they are found commonly within multiple systems as the above or foregoing images illustrate. Stephan's Quintet is a group of galaxies located at RA: 22 35 57.5 Dec: +33 57 36 with a radial velocity,redshift of 6291 km/s,z 0.021208. Known other names or identifiers include HCG 92, Stephan's Quartet, RSCG 82, RX J2236.0+3358. NGC 7173 is a galaxy located at RA: 22 02 03.38 Dec: -31 58 26.9 with a radial velocity/redshift of 2684 km/s. It has a morphological type of E and a angular size of ( arcmin ) 1.380 0.954 143. Known other names or identifiers include ESO 466-39, HCG 90c, LEDA 67878 and 2MASX J22020320-3158253. NGC 7174 is a galaxy located at RA: 22 02 06.82 Dec: -31 59 36.5 with a radial velocity/redshift of 2659 km/s. It has a listed morphological type of Im ( irregular ) and a angular size of ( arcmin ) 1.584 0.758 88. 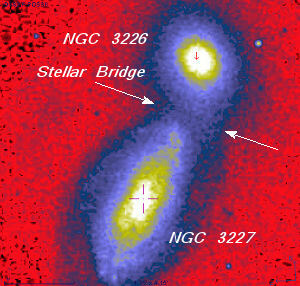 Other names include ESO 466-40, HCG 90d, LEDA 67881 and SGC 215912-3214.0. NGC 7176 is a galaxy located at RA: 22 02 08.45 Dec: -31 59 29.5 with a radial velocity/redshift of 2585 km/s. It has a morphological type of E and a angular size of 1.230 1.047. Known other names or identifiers include ESO 466-41, HCG 90b, LEDA 67883, 2MASX J22020846-3159233. Hickson Compact Group 87 photographed by the Hubble Space Telescope Courtesy NASA/STScI/AURA "Posing for this cosmic family photo are the galaxies of HCG ( Hickson Compact Group ) 87, about four hundred million light-years distant toward the amphibious constellation Capricornus. 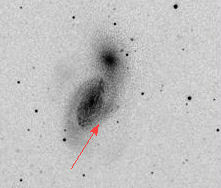 The large edge-on spiral near picture center, the fuzzy elliptical galaxy immediately to its right, and the spiral near the top of the image are identified members of the group, while the small spiral galaxy in the middle is likely a more distant background galaxy. In any event, a careful examination of the deep image reveals other galaxies which certainly lie far beyond HCG 87. 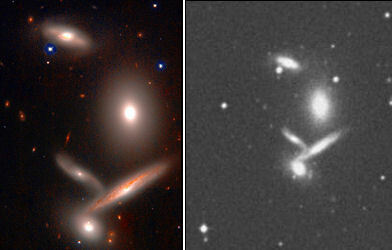 While not exactly locked in a group hug, the HCG 87 galaxies are interacting gravitationally, influencing their fellow group members' structure and evolution." APOD The image shown at the Astronomy Picture of the Day website ( 'APOD' link ) is almost a dupilcate of the one taken by GMOS-S Commissioning Team for the commissioning phase of an instrument on the Gemini Observatory's South Telescope at Cerro Pachon, Chile. The elliptical galaxy seen at mid-lower right is designated as an SO type, right at the branch in Hubbles tuning fork diagram, and is known by the identifier MCG-03-53-003 or LEDA 65409. The image in the left frame, obtained from the Aladin previewer website, is a European Southern Observatory Survey image digitized at the MAMA facility in Paris. "Sky field near some of the brighter galaxies in the Virgo Cluster. This image was obtained in April 2000 with the Wide Field Imager ( WFI ) at the La Silla Observatory. The large elliptical galaxy at the centre is Messier 84; the elongated image of NGC 4388 ( an active spiral galaxy, seen from the side ) is in the lower left corner. The field measures 16.9 x 15.7 square arcmin." 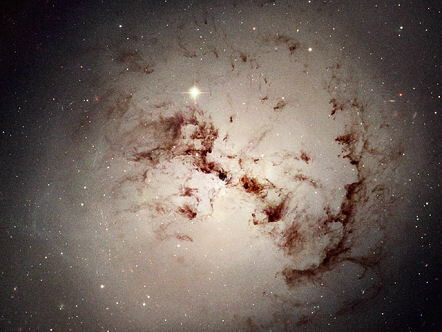 Image & text from the ESO website Bright Galaxies in the Virgo Cluster M84 was discovered by Charles Messier ( 1730  1817 ) on March 18, 1781, a date on which he also cataloged seven other nebulous objects in the same region of sky. Though little is known about him prior to his joining the Paris Observatory he is credited with 15 original and 6 co-discovered comets as well as he very famous catalogue, which he began in 1760, taking more than twenty years to compile. 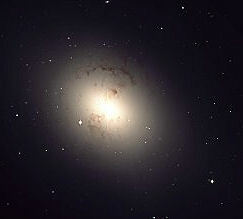 Though it is still listed as an elliptical galaxy, M84 has recently begun to be described by astronomers as a Lenticular ( S0 ) type of galaxy, an intermediate type between ellipticals and spirals that sits right at the middle branch in Hubble's tuning fork diagram. A peculiar pair of colliding galaxies, comprised of a Spiral type c and an Elliptical and known as Arp 107, are shown in the image at left. 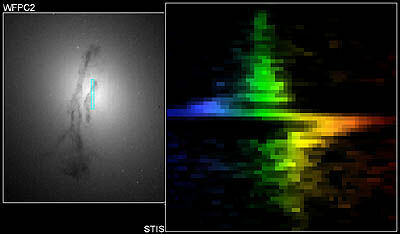 In the left frame is an image from the Aladin previewer obtained from the Palomar Observatory Sky Survey ( POSSII, Red, G avg, Blue ) The second image is from the Spitzer Space Telescope website, taken with the IRAC ( the Infrared Array Camera ) and is a composite of multi-wavelength images comprised of red=8.0 microns and blue=3.6 microns which mapped the faint regions of new star formation - younger stars are mapped at 8.0 microns ( red ) and older stars are mapped at 3.6 microns ( blue ). The two wavelength mappings are then combined to produce a single image showing astronomers the comparative areas of stellar formation and age in the outer tidal ( arrow ) arm of Arp 107. M60 Quoted text from NOAO website with astronomical data from Simbad and additional historical information from Wikipedia website. For a complete visual listing of the Messier Catalog see Wikipedia. Adventures in Deep Space This website offers "Challenging Observing Projects for Amateur Astronomers of All Ages"
Using Spitzer Colors as Diagnostics of Star Formation Regions: The Interacting Galaxy Arp 107 The Astronomical Journal, 130:21172127, 2005 November, B. Smith et. al. Interacting galaxies: Observational and theoretical aspects V. P. Reshetnikov and N. Ya. Sotnikova 1993. Astrophysics, Springer New York, Volume 36, Number 3 / July, 1993. Astronomical Institute of St. Petersburg University. Special Astrophysical Observatory, Russian Academy of Sciences. Translated from Astrofizika, Vol. 36, No. 3, pp. 435490, JulySeptember, 1993. Page Modified by Ken Pinkela -- .css Template Modified by Doreen "brite_star" L.